..if statements about some particular, necessary past are True and statements about alternatives False, then Plato, in penning his dialogues, selects a fit-for-purpose champion version of Socrates, the fictive Socrates who best serves his literary, philosophical, and rhetorical design. In so doing, in transcribing various discussions in which Socrates purportedly took part, he likely deviates to one degree or another from the True version of events (copies of copies of copies). The dialogues are well-crafted philosophical fiction. If time is backward-branching, though, many different, variant pasts might exist, each leading up to this (or any) moment. Plato chooses to write of a Socrates who is one member of a set of Socratic counterparts who lived and died in alternate histories, each with equal claim on being the genuine artefact. A set of histories, each replete with the non-identical life of a Socrates, coincide after his death in the sense that these various chronologies all contain and converge on a state of affairs that includes Plato sitting down to write, after the fact, of Socrates’ demise. Plato knew which was the real Socrates, it could be argued, from memory. But this might be an assumption exhibiting the bias of a fixed-past world-view. We attribute uncertainty about the past to doubts about the sharpness of our memories with respect to the particulars of the chronology we experience. We could combine this uncertainty with doubt about the sharpness of any particular privileged past version of events. Once more at ease with a backwards-branching time cosmology, some of the prejudices that lead people to argue this or that happened, or ‘no it wasn’t that way at all’ might be set aside. Perhaps Plato wrote, from memory and inference, of multiple Socrateses, composing from world-parts a composite philosopher more successful in more arguments with contemporaneous Hellenic luminaries than any individual Socrates (whatever ‘individual’ means anymore) ever was in truth. To call the dialogues well-crafted fiction under these conditions, fiction must be defined on grounds other than falsity. Assuming at least that distinct identities of individuals and worlds or chronologies are preserved, it can be done. We might hope in vain that even if time is backward-branching the identity of individuals is preserved: that for any individual a counterpart inhabits a single chronology and calls it home. The alternative to an orderly one-chronology-per-counterpart model is one in which selves diverge and converge continuously, moment on moment, and worlds as well, what memory retains is a piecemeal residue of steps from various selves on various paths. Subjectivity of truth under these conditions seems paramount: there’s no guarantee that the people around us have experienced like history. But if a spread of selves experience a spread of chronologies, there’s no one history anyone can name as true, even locally. The counter-argument to the notion we might share the world with individuals who’ve literally (extensionally) lived other histories is that people in general can be found to agree on many major historical facts, at least in some factual details of events. This phenomenon, though, might be accounted to a tendency whereby individuals who meet are liable to have experienced similar chronologies, rather than shared a common one. Again, if the latter seems a more natural conclusion it may be due to a long-held assumption the fixed-past model is right, rather than that the model is right. 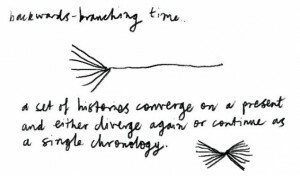 A more moderate interpretation of a backwards-branching time model allows for many chronologies, intersecting in divergence or convergence or both, but a unique counterpart of an individual for each chronology. History may be multiple, but we and our compatriots around us share a single common past. Our counterparts, and those of our fellows at this chronology, are safely away populating other chronologies. This model comes with problems I’ll get on to shortly, but has the merit of preserving some conception of truth that goes on to yield a workable definition for fiction. Taking a universal vantage, Plato’s dialogues, and many other texts set in environs resembling near and future past are true if the events described took place in one or another chronology. That is to say, any such text cannot be said to be fiction for the reason that the text’s claims are false. Fictionality has to be defined on other terms. If Phaedo is* right that Plato invented a fictional Socrates as a convenient mouthpiece, the result may be a depiction of a genuinely existent philosophical giant most amenable to Plato’s own view, but who inhabited some chronology neither Plato nor Phaedo experienced. Given a substantial enough range of chronologies, Austen’s Sense and Sensibility might likewise contain a set of statements true at some chronology. To preserve the descriptor ‘fiction’ for these texts, fiction is better understood as a text that is located at (or indexed to) one chronology, and composed of a set of claims that is true for another. From an objective vantage this definition takes fiction as a relation on two chronologies, or worlds, whereby one world is referenced in a text at another. From this standpoint, if it could be attained, it ought to be clear whether other chronologies – all or some of them – exist or do not. That is, from an ideal vantage there is an answer to be had in each case as to whether a fiction has a corresponding fictional world of reference. Ordinarily, any judging of a text’s fictionality is conducted at a specific time, by an agent who perhaps possesses a sense of having lived a single history. The determination of the truth status of a text obviously doesn’t always involve a wrangle over which is right: that there are many existent versions of the past, or present or future, or one, and if many, which exist and which do not. But without access to the universal truth, a parochial determination might be made a text is not true locally. This leaves open the possibility that the state of affairs depicted took place at a chronology inhabited by counterparts, and too the possibility that there is no frame of reference for which the claims in the text hold true: an honest agnostism is allowed concerning the existence of alternate chronologies. According to the definition for fiction under discussion, in either case above the text judged at a time and a chronology is fairly considered fiction, yielding a definition from local truth that complements the relational definition for fiction from a cosmopolitan vantage of universal, or super, truth. That is, pegged or indexed to a particular time, in a particular chronology, a certain set of truths, if uttered or written, prove true. A fiction is a text that does not hold true at this time, for this chronology, but possibly holds for some other, fictional chronology. The argument put above defines fiction in first a relational and second an indexical way, with the two definitions taken as complementary and not conflicting. The argument’s focus on backwards-branching time is, though, a veneer. Underlying this for-instance is a more general argument for a modal or possible-worlds approach to fictionality. Branching time models, as discussed, are one path to parallel realities or possible worlds. In the context of truth in fiction, any way of having alternate chronologies or worlds is as good as any other, whatever the explanation for their instantiation. On these grounds, then, a fiction is a text of one chronology, or world, that is locally false but possibly describes another chronology, or world, or describes no world at all. The difficulty with the model that yields the coherent past-branching-time model is evidenced in comparing the moderate indexical-truth-preserving model for multiple pasts with a model for multiple possible futures. According to a branching-future model, as it might be intuitively grasped, if more than one future holds true, (if C., going home, catches a bus in one chronology, and walks in a second) then it is because a chronology splits into two or more at a point of divergence. We don’t presume there have at that point instantly been both worlds independently existent all along, it would be profligate and magical to do so. If there are two causally independent worlds then they owe their existence to some other ontological provision for possible worlds. 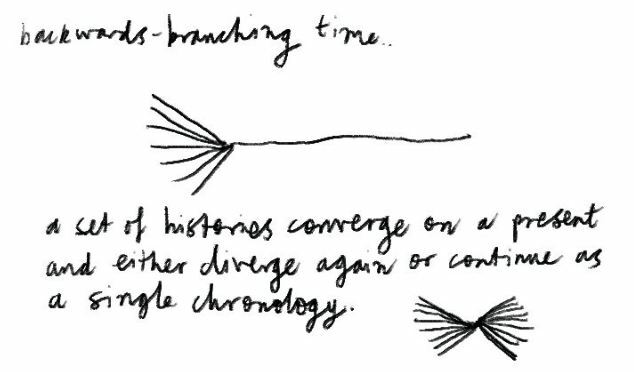 One chronology becomes multiple in divergence, why shouldn’t it be that multiple chronologies become one in convergence. It’s no easier to account for past-future asymmetry in this model than in any other. But a significant part of the appeal of a backwards-branching model of time is in the prospect symmetry might be elicited from it. That it isn’t a matter of ready consequence might be the ruin of backwards branching time theory. If there are multiple pasts, why don’t our memories contain bits of many different histories and how to be sure they don’t. *Yet the present tense is natural enough for discussing truth of Phaedo’s claims made over two millennia ago.